HWP complies with the strictest international heat-treatment standards (ISPM-15), guaranteeing the annihilation of all larvae and parasites that may be present in the wood used to produce our wooden pallets and crates. Heat-treatment is different than kilning; as heat-treatment completely eradicates any living organisms in the wood, whereas the goal of kilning is to simply dry the wood. HWP guarantees that our wood packaging products meet and exceed the most stringent hygienic and sterilization standards currently enforced in the food, pharmaceutical and other industries today. Only manufacturing companies licensed by the Canadian Food Inspection Agency (CFIA) are eligible to manufacture ISPM-15 certified products. Don’t find yourself stuck at the border; choose a company like HWP who is fully certified to manufacture ISPM-15 compliant wooden packaging products. Make sure you check your wooden packaging for the correct stamps. 000= License Number (Unique number for each approved manufacturer) *Note: Some countries also have a two-digit agency code before this number, so the final number looks like this: 00 000. 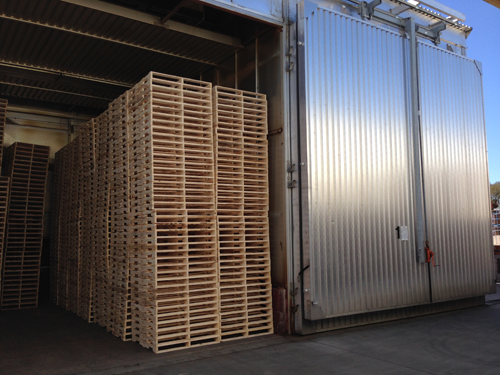 Because disease and pest control continues to be a major factor when shipping goods, we have some of the highest heat-treating standards in the wooden pallet manufacturing business today. Cross-border shipments require stringent international heat-treatment standards for wooden pallets and crates, as regulated by ISPM-15. These regulations require that all wooden packaging materials be either fumigated or heat-treated. Because fumigation uses toxic pesticides and chemicals to eradicate any pests, heat-treatment is the preferred method. Find out more about ISPM-15 requirements by reading this PDF document of frequently asked questions. Canada and the USA are considered one domestic market and have looser shipping requirements when shipping between each other. However, there are 23 countries globally including North America, Australia, New Zealand and the European Union who have signed on to the IPPC-ISPM-15 program. Choosing to ship with compliant heat-treated wooden packaging ensures that you will not encounter any problems when shipping your products. Using quality components for all of our wooden pallets and crates is what distinguishes our products from our competitors. Every component and process here at HWP is chosen and performed with quality in mind. That’s why we are proud associates with the renowned kilning company: Cathild Kilns. Our kilns are Cathild, and we guarantee consistent results, every time.